Phillips 66 (NYSE:PSX) has seen an increase in support from the world’s most elite money managers recently. Our calculations also showed that PSX isn’t among the 30 most popular stocks among hedge funds. Let’s take a peek at the new hedge fund action encompassing Phillips 66 (NYSE:PSX). At the end of the fourth quarter, a total of 47 of the hedge funds tracked by Insider Monkey held long positions in this stock, a change of 9% from the second quarter of 2018. 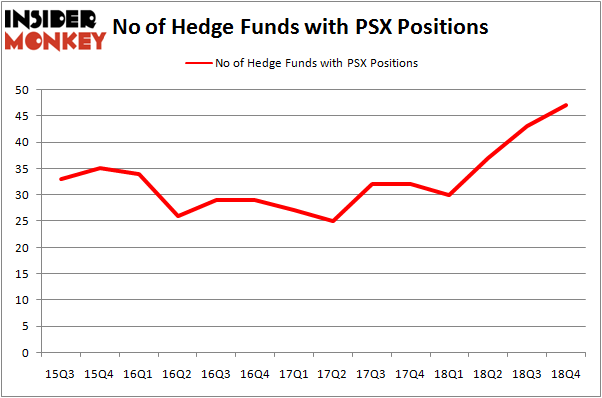 The graph below displays the number of hedge funds with bullish position in PSX over the last 14 quarters. With hedge funds’ capital changing hands, there exists a select group of notable hedge fund managers who were upping their stakes considerably (or already accumulated large positions). 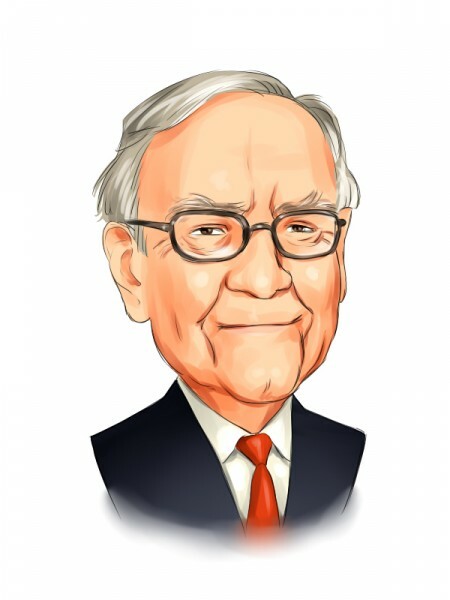 More specifically, Berkshire Hathaway was the largest shareholder of Phillips 66 (NYSE:PSX), with a stake worth $1024.8 million reported as of the end of September. Trailing Berkshire Hathaway was AQR Capital Management, which amassed a stake valued at $185.4 million. Millennium Management, Renaissance Technologies, and East Side Capital (RR Partners) were also very fond of the stock, giving the stock large weights in their portfolios. With a general bullishness amongst the heavyweights, key money managers have jumped into Phillips 66 (NYSE:PSX) headfirst. Capital Growth Management, managed by Ken Heebner, established the biggest position in Phillips 66 (NYSE:PSX). Capital Growth Management had $33.6 million invested in the company at the end of the quarter. Michael Kharitonov and Jon David McAuliffe’s Voleon Capital also made a $12.1 million investment in the stock during the quarter. The following funds were also among the new PSX investors: Clint Carlson’s Carlson Capital, George Soros’s Soros Fund Management, and Peter Algert and Kevin Coldiron’s Algert Coldiron Investors. Let’s check out hedge fund activity in other stocks similar to Phillips 66 (NYSE:PSX). We will take a look at Kimberly Clark Corporation (NYSE:KMB), Humana Inc (NYSE:HUM), Brookfield Asset Management Inc. (NYSE:BAM), and Mizuho Financial Group Inc. (NYSE:MFG). This group of stocks’ market valuations match PSX’s market valuation. As you can see these stocks had an average of 28 hedge funds with bullish positions and the average amount invested in these stocks was $1157 million. That figure was $2113 million in PSX’s case. Humana Inc (NYSE:HUM) is the most popular stock in this table. On the other hand Mizuho Financial Group Inc. (NYSE:MFG) is the least popular one with only 4 bullish hedge fund positions. Compared to these stocks Phillips 66 (NYSE:PSX) is more popular among hedge funds. Considering that hedge funds are fond of this stock in relation to its market cap peers, it may be a good idea to analyze it in detail and potentially include it in your portfolio. Our calculations showed that top 15 most popular stocks among hedge funds returned 19.7% through March 15th and outperformed the S&P 500 ETF (SPY) by 6.6 percentage points. Hedge funds were also right about betting on PSX, though not to the same extent, as the stock returned 15.3% and outperformed the market as well. Do Hedge Funds Love Diageo plc (DEO)? Hedge Funds Have Never Been This Bullish On Thermo Fisher Scientific Inc. (... Itau Unibanco Holding SA (ITUB): Are Hedge Funds Right About This Stock? Were Hedge Funds Right About Dumping Twenty-First Century Fox Inc (FOX)? Were Hedge Funds Right About Buying United Technologies Corporation (UTX)? Were Hedge Funds Right About Buying Costco Wholesale Corporation (COST)?